The backyard erupted with cheers when the team across the net missed the volleyball that my 62-year-old father had just spiked. It was a hot afternoon in El Paso last summer and I was relaxing by the pool in a friendâ€™s backyard during a barbeque, when I heard my name: â€œKatie-Meelel!â€ and watched the ball bounce across the deck. Â I didnâ€™t even have to look up to know it was my dad calling me – heâ€™s the only one who calls me by my full first name. â€œAre you sure you donâ€™t want to play?â€ he asked. I was sure I was afraid of getting smacked in the face with a flying object, but I could see the child-like anticipation in his face. For my father volleyball isnâ€™t just a sport, it was his mode of transition as a Chadian immigrant to the United States in 1991. He arrived in the United States on a Saturday and by Sunday he had joined our churchâ€™s volleyball league. My father, Neaouguen Nodjimbadem [pronounced Nay-Ow-Gen No-jim-bod-em], began his migration in 1982 when civil war pushed him out of his home country of Chad into Tunisia. He continued the journey when theological seminary pulled him to France. Iâ€™m never surprised when people realize Iâ€™m Nodjiâ€™s daughter and gush about how helpful he was at some fundraiser or how hilarious he was as a counselor at the churchâ€™s youth camp. Â Heâ€™s the type of person who volunteers to supervise a group of middle schoolers on a 30-hour bus ride to Chicago for a mission trip and returns with nothing but positive things to report. In spite of the horrors and tragedies he has endured due to a cultural revolution and religious persecution, my father radiates positivity and love toward the people around him. It is because of him that I will always have one of the most story-worthy names in a group and the curliest of hair, but it is also because of him that I have learned to love the world, other cultures, and most importantly the people around me. My parents met at the theological seminary in Vaux-sur-Seine and quickly developed a friendship that became a romance. But, this was no fairytale. American bureaucracy complicated my parents transition to married life. Â After their wedding my mother had to return to her job in the U.S. while my father waited almost nine months to receive an interview regarding his Green Card request. After receiving permanent residency in the U.S. my dad hopped on a plane and headed down to El Paso where my mother was already living for her job at a publishing house. Though they had considered moving back to Africa or remaining in France after marriage, my parents have made El Paso home. My dad says France and Chad are only places to visit now and he has no plans to leave this home. 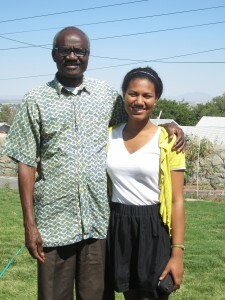 Heâ€™s learned how to embrace his Chadian identity while living out his American dream. Â When he returns home from work, my dad gardens in our backyard to the tune of music in his native language, Ngambai, or he sits at the computer to read news from Chad, but heâ€™s accustomed to his rib plate at Great American Steakhouse and he loves to watch major league baseball on ESPN. Heâ€™s said that one of the most jarring aspects of living here is the liberty we have to live life without fear of the rampant corruption and violence that became the norm in his native country. He no longer walks around in fear of being apprehended by the police as he once did in Chad. My dad still uses volleyball to foster community as he organizes volleyball games for international students who attend our church (many of whom have come from as far away as Sri Lanka, Ghana, and China). I can see how their faces light up at his invitation to join him on the court. I donâ€™t recall who won the game that summer day in 2012, or if they were even keeping score, but I do remember the sound of the boisterous laughter and the claps of the victorious high fives. I also remember that my dad finally convinced me to kick off my sandals and join him on the grassy volleyball court to play a game for which I have little skill, but I know that he loves. I will continue to duck and stumble whenever a volleyball comes near me, but Iâ€™ll always stay on the court for him.